The Geschwister Pfister – a German-Swiss-Croatian comedy trio – have written operetta history, many times over. Yes, they were the driving force behind the famous Im weißen Rössl at Bar jeder Vernunft in 1994, with its all-star cast preserved on DVD. But they have done much more. To name a few highlights, Christoph Marti was the leading lady in Emmerich Kálmán’s Csardasfürstin at Cologne Opera, he was also a ravishing blonde bombshell Clivia at Komische Oper Berlin. In both productions, Andreja Schneider had lead roles too, and at the Opera St. Gallen in Switzerland Tobias Bonn starred as the male lead, Count Tassilo, in Gräfin Mariza. 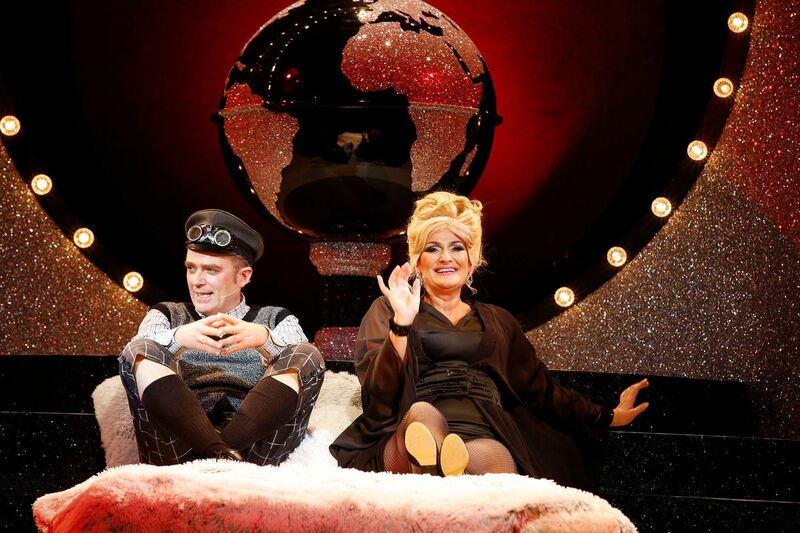 Currently, all three are in the revival of Paul Linke’s science fiction operetta Frau Luna at Tipi am Kanzleramt: a show about sexual liberties enjoyed while taking a walk on the dark side of the moon, where Miss Schneider rules supreme as the lusty godess of the moon. That production is a great example of a newly rediscovered joy in cross-dressing and gender bending in operetta, with Christoph Marti playing Frau Pusebach, Katharina Thalbach appearing as Prinz Sternschnuppe and Fausto Israel as Venus. For a long time, this core element of original operetta had fallen out of favor. Recall the many attempts to turn Prince Orlofsky in Die Fledermaus into a tenor, because that supposedly made the genre more “serious” and “realistic.” Erich Wolfgang Korngold started the trend in the 1920s when he re-wrote Fledermaus for Max Reinhardt and had Oscar Karlweiß as Orlofsky; later such unlikely people as Wolfgang Windgassen took on the role. (Available on disc, with Karl Böhm conducting.) Today, it seems, audiences and operetta producers are enjoying the original “horrible prettiness” and “satanic subversiveness” once more that Robert C. Allen outlines in his book. 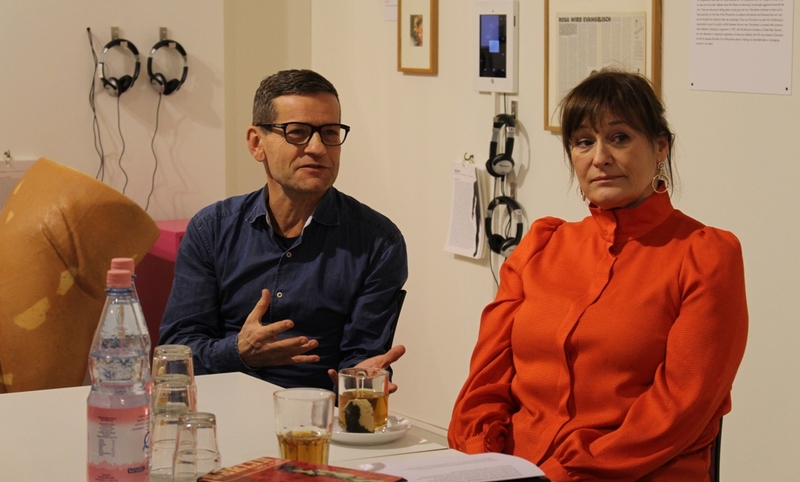 Two members of the Geschwister Pfister team came to the Schwules Museum in Berlin this week to discuss the phenomenon, and to talk about their future operetta plans involving a cross-dressed Ball im Savoy in Nuremberg, among other things. 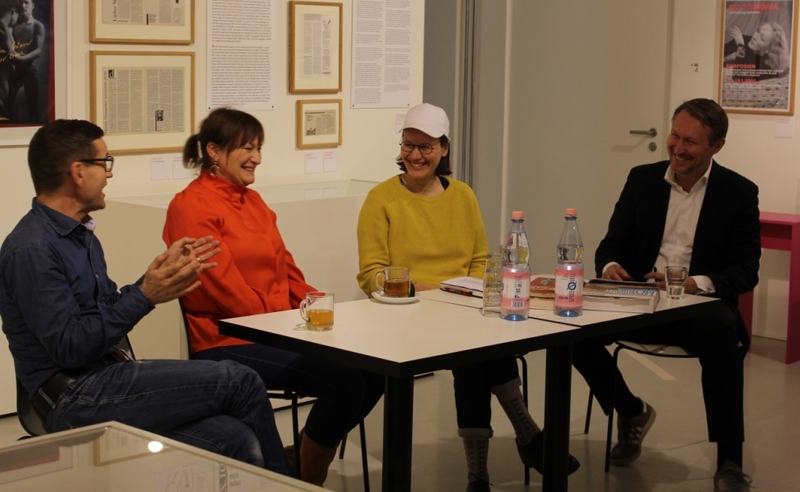 For the talk, Vera Hofmann joined the discussion, she is the curator of the 12 Moons series. She said her aim with 12 Moons was to ask “what it means to be female,” what a “specific female gaze” is, and whether “men” and “trans* people” are included in this queer feminist debate. The idea of producing Dostal’s Clivia – which originally premiered at the end of 1933, after the take-over of the Nazis in Germany – put Kosky off, originally, because he said he couldn’t get his “Jewish heart” to accept such a piece. The Pfisters had already given up hope and were busy looking at other titles when Barrie came back and told them he had re-read the script and listened to the music and found Clivia should be put on, because there was no direct evidence of Nazi ideology. This new willingness to take risks very much depends on the people at the head of theaters. Barrie Kosky is one glorious example, because resurrecting forgotten shows is “who he is, he couldn’t do it any other way.” That’s a blessing, for performers and audiences and operetta fans tired of the same old titles performed over and over again. When asked what they can be seen in next, they mentioned a Fledermaus production in Switzerland 2018, and Ball im Savoy in Nuremberg, at the opera house, in early 2019. “That Nuremberg opened their doors for us and our way of performing Ábrahám is definitely the result of the operetta renewal that has sweept Germany. This would not have been imaginable a decade ago.” Tobias Bonn will perform the tenor lead of Aristide, Christoph Marti will be Daisy Darlington, the jazz singer, and Andreja will play Daisy’s love interest, Turkish Ambassador Mustafa Bey. So there’s double cross-dressing and a different way of handling the show than in Berlin in Kosky’s own production. After the talk, many visitors went to take a look at the 12 Moons film lounge, had their photo taken with the Geschwister Pfister, and discussed when to go see Frau Luna which runs till 11 March, 2018, every night except Mondays. For more information on 12 Moons, click here. For performance dates of Frau Luna, click here.